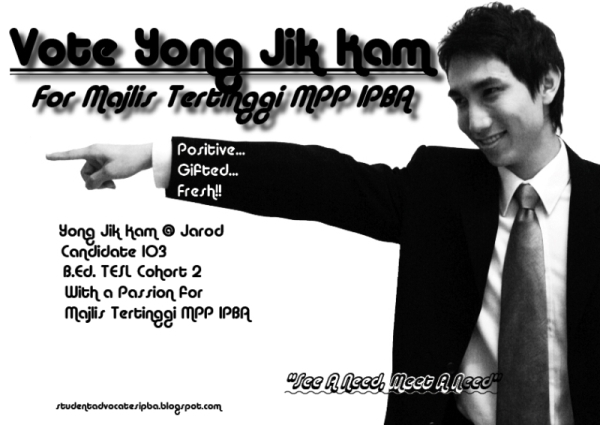 This is my offcial poster for the 1 week campaign for High Council of the Student Representative Council of IPBA. It will be placed in various strategic locations in IPBA to publicise my candidacy & hopefully gain me a few votes. I also hope that these posters will lead people to visit an election campaign blog I'm co-authoring with two other candidates. In the Student Representative Council, there are two levels: the High Council & the Executive Council. The High Council comes up with the ideals for the organisation while the Executive Council implements these visions in their respective agencies. There are 7 seats in the High Council & 14 candidates contesting for the seats. So I do have tough competition... However, each IPBA student can vote for 7 candidates, so all I have to do is get myself included in the 7 votes of most IPBArians. If I play my cards well, there will be a high probrability for that! My main campaign platform is the campaign blog. This is because the students in IPBA are so bogged down with homework, assignments, compulsory meetings & etc... I don't want to take too much of their time forcing them to listen to my whole manifesto... So when I get the chance, I'll just entertain some people, tease them with a little bites-sized servings of my delicious manifesto, and then I'll tell them to read the blog if they want to know more! The blog is Nas + Jarod + Hafiz = Student Advocates of IPBA. Co-authored with Nasrul (High Council candidate) & Hafiz (Executive Council candidate). My manifesto is there so do check it out! - my health will stay strong as I slave through the night working on my campaign!